The history of the city of Jurmala, Latvia, is closely related to the music and sound. Analyzing this, we considered a rational dissociation of this relationship. Indeed, Jurmala has always welcomed musicians, composers, who come to enjoy its calm to create new works, but also to perform for the public of important festivals. In addition the site offers a particular sound environment, an original acoustic atmosphere. It's not absolute silence, but a soothing pink noise background combining the wind in the pines, the waves breaking on the sand, and sometimes vocalizations of seagulls. Thus in Jurmala, there are sounds in three different contexts: the cultural abstraction of musical composition, the diffusion of this structured music, finally natural noise as a background. Consequently there is a gradation of sound, from the most structured one to nature acoustic chaos, from cultural design to the murmur of the elements with their absolute disorder. 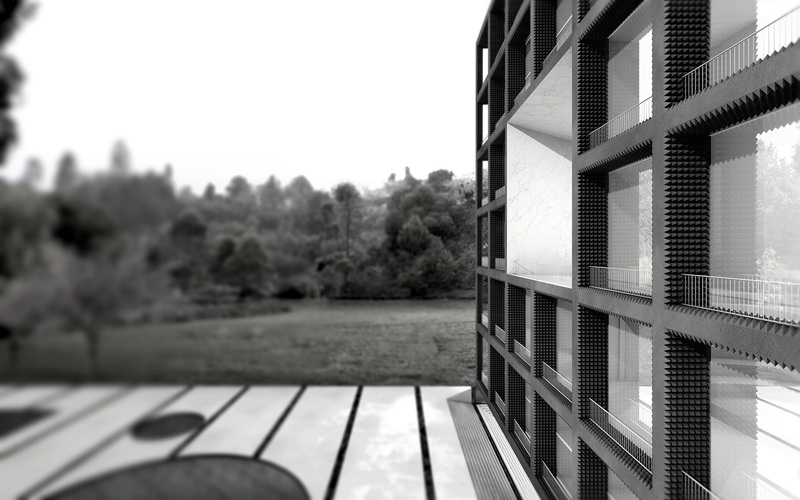 Following this principle, our project wishes to experiment this gradation from an architectural point of view. In some kind of rigorous classicism, we first need to create a pure abstract frame, the "equal temperament" tuning of our project, a spatial and rational division to guide our notes. Then this is a 6.60m build frame, a strict grid as a musical score. 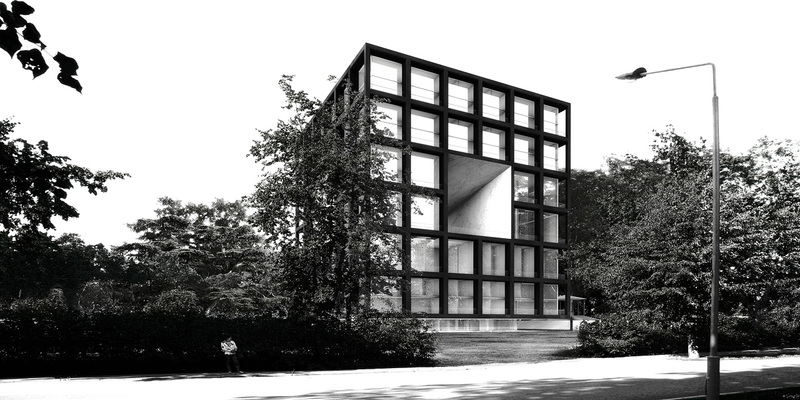 Next, the architectural composition is governed by a strong organizing principle, structured around a hollow volume. The central void, 6 trapezoids orientated in all directions, is a sound vector without a defined programmed, a neutral space channeling acoustic waves. The hotel program then develops into the filled space, inside the gap of our hollow channel. The public areas are housed around the central void, half height of the building. The hotel rooms are organized in the periphery in a rational and regular way, at the 2 first and 3 top floors. Finally the sound wave itself, from a physical point of view, is addressed in the project through the use of specific materials. Still with a binary and monochrome radicalism, the hotel takes on two types of coating that are – beyond their aesthetic – two ways to react to sounds. 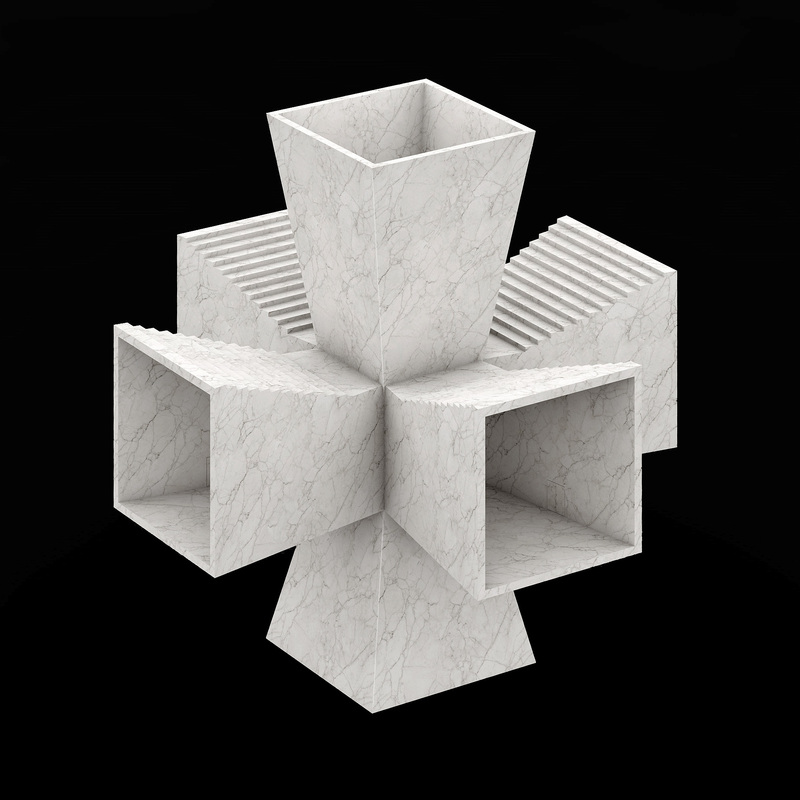 In order to channel, reverberate and direct a pure selected sound wave, white marble with a perfectly smooth surface is used in several parts of the building, particularly in the central void, a kind of multidirectional cones. With its trapezoidal shape, it helps to amplify and broadcast the sounds produced inside it, or to capture the sounds on one side of the building to make them travel and reissue on the other side. This way the building is no longer an obstacle to environmental noise, but a distorting lens, reverberating and channeling acoustic waves like a mirror. Conversely, to absorb, felting, soundproof spaces, anechoic foam lines certain areas. 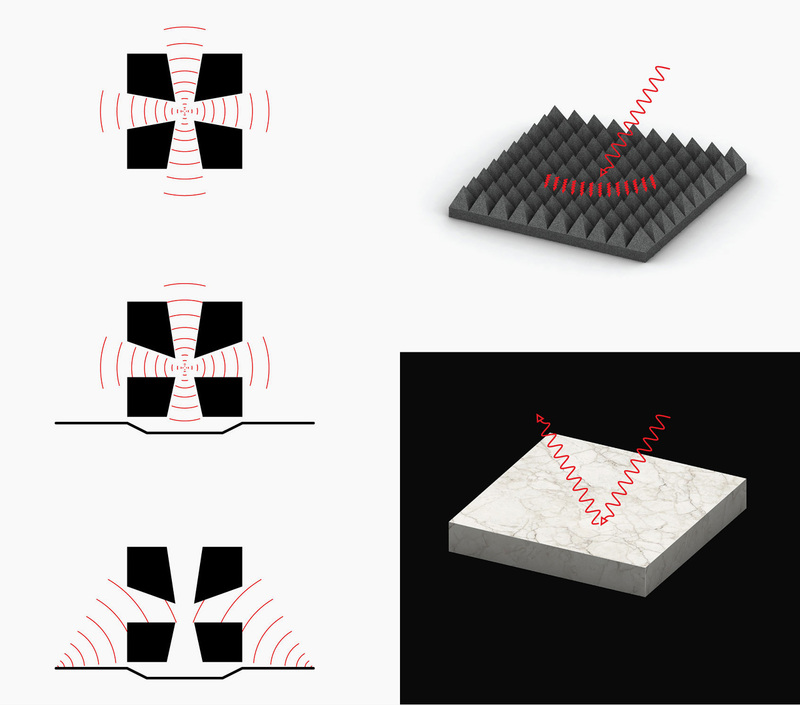 Pyramidal or wedge shapes are best suited to capture sound waves, trapped in the convolutions of the material. This type of form and material is typically used in music studios or science facilities such as anechoic chambers to simulate full vacuum and absence of echo. In our hotel rooms, the atmosphere is only designed with this idea in mind, creating an anechoic space punctuated by reverberating marble functional objects, such as the shower block or table. From a acoustic and conceptual perspective, only those items "react to the sound", only they acoustically exist in space, along with and the sound from the speakers built into the architecture. Eyes closed, it is impossible to guess the shape of the space in which we are, it is more of an abstract place, a somewhat unreal and literally unheard spatial and acoustic experience. The outer structural frame of the building is covered, in balconies, with concrete anechoic pyramids precast within the slabs and columns. These forms – this time with diffusing properties only – allow an explosion of the outside sound wave, neutralizing external noise without reducing its intensity. As a result, these various materials create special sound qualities and unique acoustic atmospheres. Access to the building (which is slightly off the ground) is through a horizontal fault down the stairs. 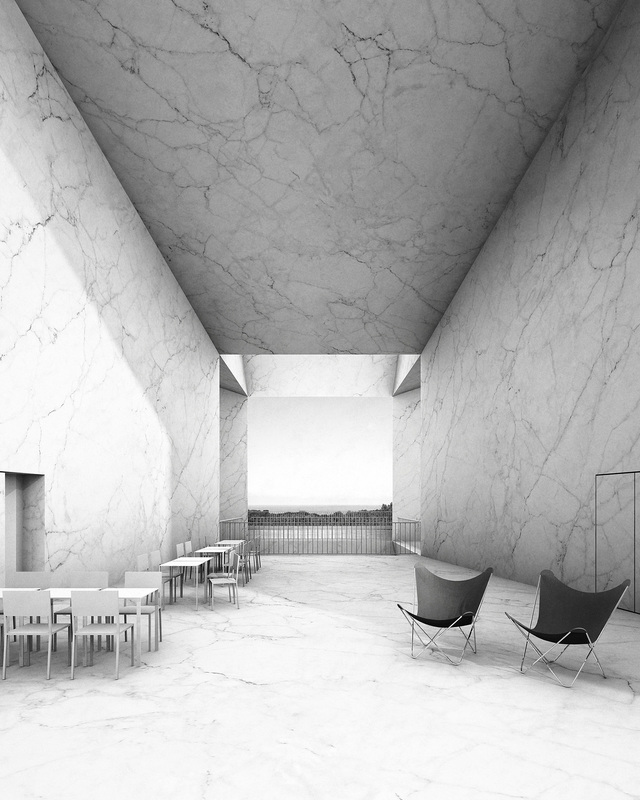 In this low level, the lobby welcomes the tourist in a mineral and minimum atmosphere in a telluric in-between space, an informal belt around a patio that hints at the large hollow cross right above. From this level, four vertical circulations lead to other floors. 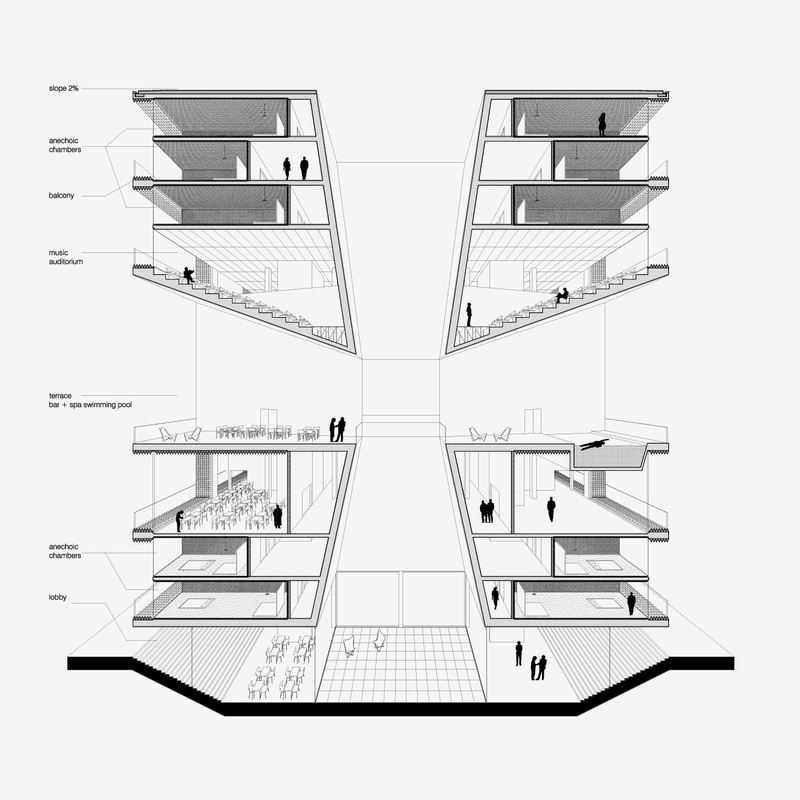 In each of them, the stairs and elevators are connected to the rest of the program through a corridor that surrounds the marble hollow core. At the terrace, leisure programs such as restaurant, a conference room and the spa fit in the four corners. A small pool is also included in the terrace. 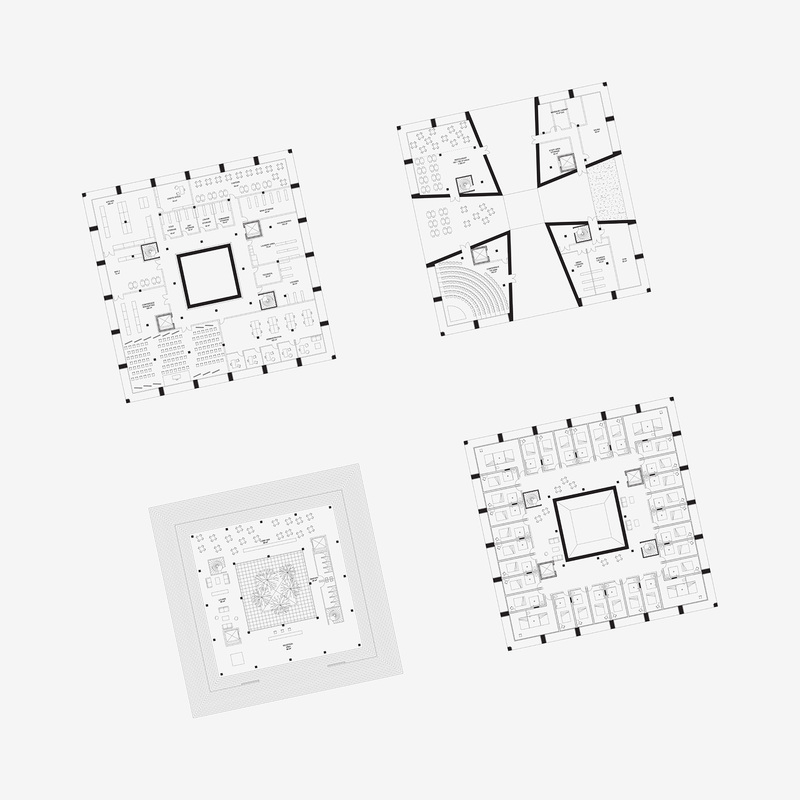 On top of that big void, four auditoriums face each other, separated by the central void, offering a free space that can be used as art and music gallery. 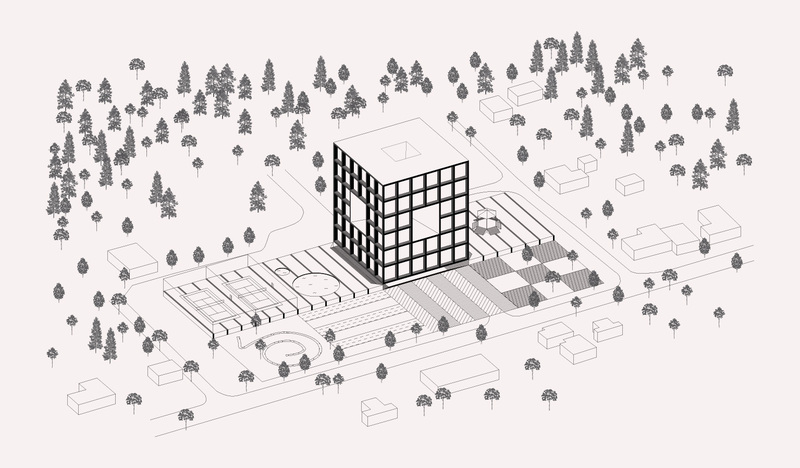 Within the site, the project extends its structural frame to the east and west. The area south of the building is left open, with lot of trees and a parking lot. East and west squares are raised on a large framed base to identify specific functions : to the east, there is a bandstand where events can occur outdoors, in the west squares the first tile hosts a 270m² circular pool, while the second features two tennis courts. As a true musical composition, playing on both culturally defined tuning system and physical specificity of the acoustic wave, our project is developing an architectural language in which these invisible dimensions take shape. Indeed, the wide scale binary rhythm and structure support for infinite modulations, logical variations made of counterpoints and harmonies. The architecture of the hotel doesn't serve here a formal purpose. 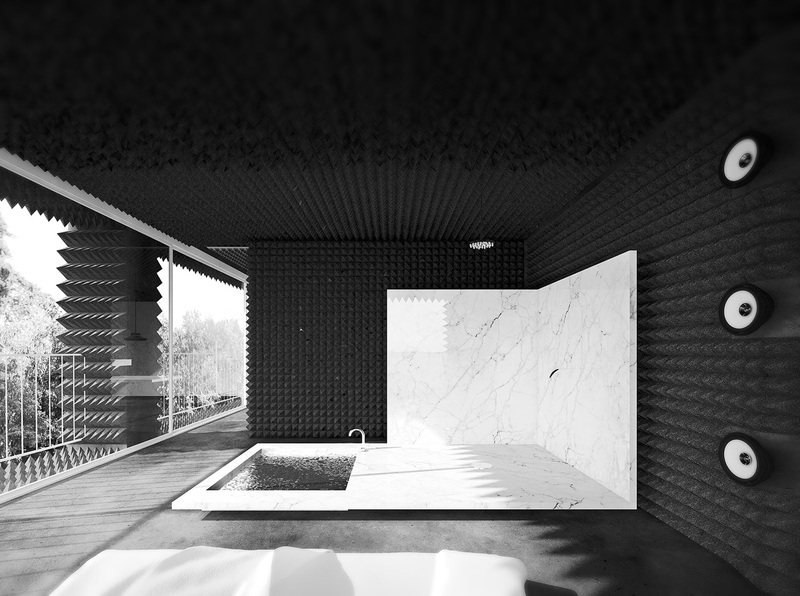 In this project it is truly about an acoustic composition of space.